Allendale Acres provides a space for community members to grow fresh organic produce and to cultivate relationships with their fellow neighbors. 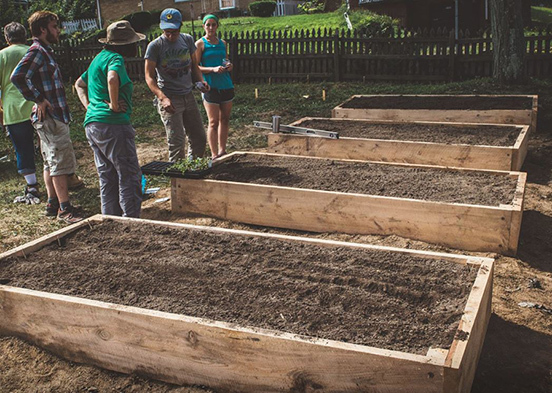 We offer individual raised beds for anyone that is interested in gardening in their own space for a small rental fee. The garden is also committed to serving the surrounding area and would like to invite any community group to the garden and offer a place for them to grow and learn. We are located in the Sheraden, next to the AMPAC building, at 3128 Allendale Street. We feel that our garden is the perfect catalyst to foster knowledge, teach skills, and provide opportunities that ensure access to affordable, nutritious food that is locally based and sustainably produced. The garden was started by a group of committed individuals as a collaboration between Sheraden residents, Grow Pittsburgh, and the Pittsburgh Urban Gardening Project. Our goal is to invite as many community members to be part of this amazing project and to offer workshops year round that focus on gardening tricks and tips, sustainability, and how to be responsible environmental stewards. You are interested in renting out a raised bed for the year. Based on a first come first served basis. You are interested in volunteering with us. We accept anyone who is interested in helping the garden succeed. We need volunteers for build events, organizing, social media, writing grants, fundraising, and general seasonal volunteers. Come join us for our regular meetings! You can donate to the garden. Whether that’s materials like compost, tools, or even a book case. We aren’t picky and will probably find a use for it. We also accept money donations. You are just interested in learning more about the community garden. If you’re not sure how you can help out, contact us and we will find a place for you in our project.